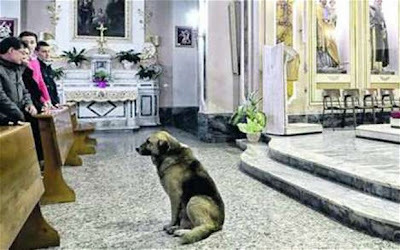 Two months after his owner died, a dog in Italy keeps turning up each day at the church she used to attend. Ciccio, a 12-year-old German shepherd, waits in vain in front of the altar of the Santa Maria Assunta church in the village of San Donaci in the southern region of Puglia. He heads to the church as soon as the bells begin to ring each afternoon, just as he did for years when his owner was alive. The woman, who was known in local dialect as "Maria tu lu campu" - "Maria of the fields" – died suddenly in November. Ciccio attended the funeral, following his mistress's coffin as it was carried into the church. The dog's devotion has so impressed villagers that they have adopted him as their own, giving him food and water and letting him sleep in a covered area outside the church. The local priest, Donato Panna, allows him to sit in front of the altar during Masses, baptisms and other services. He is now hoping to find a new home for the faithful hound. His behaviour is reminiscent of Greyfriars Bobby, a Skye Terrier who became famous in Edinburgh for spending years guarding the grave of his owner.